Dance Commentary by Heather Desaulniers: "L’Allegro, il Penseroso ed il Moderato"
Think of a prolific contemporary choreographer. Someone who has created dozens, maybe hundreds of original dance works. You can probably name a number of the titles and maybe even recall when you first saw some of them. But amongst your favorites, perhaps there is one that is special. A composition that you most clearly associate with that particular dance artist. 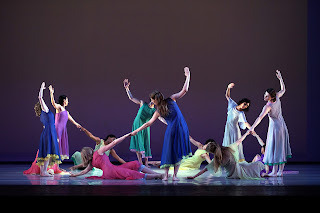 After doing some reading in preparation for a show at Cal Performances, it seems that when many fans, scholars and academics consider the canon of Mark Morris’ work, 1988’s L’Allegro, il Penseroso ed il Moderato is that standout piece. Thoughts, opinion, commentary and analysis alike all extolling the brilliance of its architecture, the purity of its form and the beauty of its movement. This was the framework that would inform my first experience with this seminal dance. Indeed. L’Allegro, il Penseroso ed il Moderato is beautiful choreography and lovely dancing set to gorgeous music. A piece that entertains with structural diversity, imaginative staging and creative movement. The full-length, two-hour feat is a visual and aural exposition; bringing together Morris’ physical vocabulary with Handel’s oratorio, performed at this engagement by the Philharmonia Baroque Orchestra and Chorale (under the impeccable musical direction of Nicholas McGegan) with four marvelous featured soloists. Morris’ marriage of music and movement is by far L’Allegro, il Penseroso ed il Moderato’s greatest achievement. Choreographically, L’Allegro, il Penseroso ed il Moderato runs the gamut from gestural phrases to picturesque imagery to humor and whimsy. And varies compositionally with canon, unison and the twenty-six member ensemble organized into every formation imaginable. L’Allegro, il Penseroso ed il Moderato opened with buoyant, joyful attitude posés and jumps, very Duncan-esque in visual style. Jubilant leaps continued, leading into a comical sequence of trenches for the men and the women. Halfway through Act I, a sprightly, cheeky and impish male solo delighted with parallel passés, buzzing bourées and butterfly-like arms, while other cast members peeked in at the action from the wings – very Nijinsky meets A Midsummer Night’s Dream. Morris’ use of the wing space was a highlight overall, though this device is fairly common in his work and certainly not unique to L’Allegro, il Penseroso ed il Moderato. Living sculpture came on the scene in a sequenced lift phrase, where partners were gradually taken out of the picture at each repetition. And comedy returned in the horse and carriage vignette. L'Allegro, il Penseroso ed il Moderato in Madrid, 2014.
to the eye. And the men’s dance that followed had an overly campy start. Having said that, the women’s circle dance was glorious with its reaching limbs, attitude posés (from the dance’s opening moments), curved arms and long, low extensions. L’Allegro, il Penseroso ed il Moderato concluded with a flowy sequence of running, leaping and skipping, the dancers moving like waves through the space, and into their final formation of concentric circles. L’Allegro, il Penseroso ed il Moderato was an elegant expression of movement and music, performed flawlessly and phenomenally by the entire company on Friday night. No question. Though for me, the dance was neither revelatory nor surprising nor a standout. And it seems a little dated, at least for my taste. But that observation doesn’t erase what was a pleasurable, enjoyable evening of dance performance, one that didn’t make demands on the viewer.